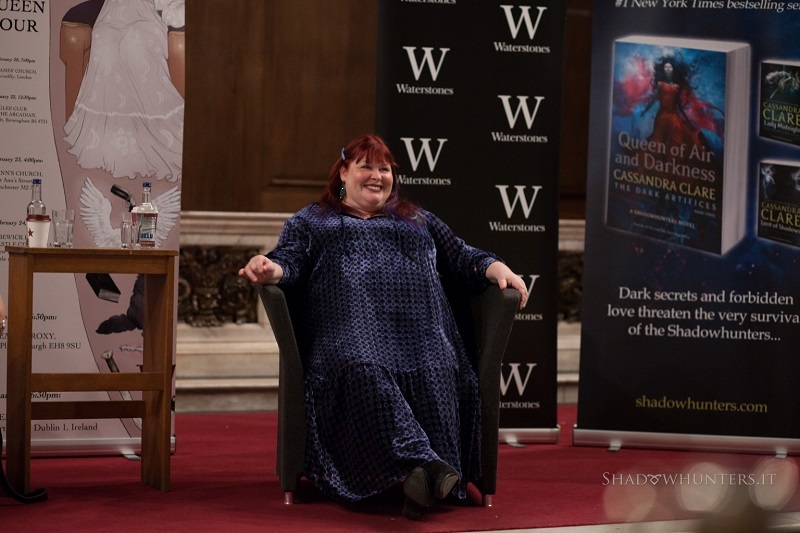 Last month while in London I once again had the chance to interview Cassandra Clare. We sat down with a nice cup of tea and talked about her (upcoming) books, her first adult series Sword Catcher, collaborating with different authors and more. Chatting with Cassie was a lot of fun so thanks Cassie and thank you Fritha L. and Simon & Schuster UK for arranging everything. Enjoy the interview and make sure to enter our giveaway! High tea and Plushie Will with @Cathrinreadsbooks at the Soho Hotel in London! Who should be the next plushie? Baby Max? Ty? Dru? Emma? Clary? Jace? Jem? TMI Source: Thanks for yet another interview with us, let’s jump right in. About Queen of Air and Darkness, so many readers, myself included, expected or hoped for Zara to die [Cassie laughed], WHY didn’t she? Why is she still alive? And is she going to be once again the villain or one of the villains in The Wicked Powers? Cassie: Yes, she is one of the villains in The Wicked Powers and that’s why I left her alive. I mean Zara is awful, she’s the worst, but technically speaking, the ringleader was her father Horace, so it was more important for them [the characters] to take him out. I think she is very lucky that she survived. We still needed her because that ending wouldn’t have been possible without Zara. It shows how extremist she’s become, that she would do something like threaten a suicide mission, to kill herself and everybody else, all these children, without any empathy. It’s a good symbol of what the Shadowhunters who are in that Clave are like now. We’ll get to see a tiny glimpse of her in The Lost World but otherwise we’re not going see her until The Wicked Powers, she’s a significant character there. The Red Scrolls of Magic is going to be published very soon and so many people are excited. When you co-wrote the companion novels to your Shadowhunter Chronicles, you wrote with female authors, your friends actually. Sometimes you were together, writing at the same table, but now you’ve written The Red Scrolls of Magic with Wes, who was probably in a completely different state, so did you communicate over email or Skype? What was it like to write with a male author? I just turned in the first draft! You said that Chain of Gold has been years in the making, how does it feel to finally, 100% focus on these characters? And what is it like to return to your characters from The Infernal Devices with them now being secondary characters? It’s really nice [to focus on Chain of Gold]! The characters have a different focus than they did in Infernal Devices. So obviously Will and Tessa are still important, they are James and Lucie’s parents, but that’s it. They are important because they are James and Lucie’s parents, not because they are Will and Tessa. So it’s interesting to come at it from a different angle, keeping in mind that the characters that are driving the story are Cordelia, Lucie, James, Anna. They are going to relate to all these characters we know as parents and not as main characters. We do get to see them and it’s always nice to hang out again with Gideon and Sophie, we see some Cecily, Gabriel and of course we spend a good amount of time with Will and Tessa and Jem. Everyone’s caught up in an emergency; the appearance of demons that are able to attack in daylight, demons that possess a deadly poison which the Enclave has no antidote for. Are these attacks happening only in England? Only in London. The Clave is trying to keep the threat contained, but obviously that’s hard with so many factors outside their control! The characters in Chain of Gold are isolated in the city, trying to figure out what kind of demons they’re dealing with, and who the mastermind behind the attacks could be. And meanwhile of course, having complicated personal relationships. And you’re excited to write it because it definitely sounded like you were fangirling yesterday [during Cassie and Holly’s event] when you talked about the fashion and everything. Yeah, I looove the time period. I love the clothes, the fashion. It’s a bit Downton Abbey for people who love that stuff. I love the description of things, it was such an interesting time when things were changing. Queen Victoria died in 1901, so this is very early into the Edwardian era, and everybody has this immense optimism and excitement. It was called the Belle Époque, the beautiful time, because it was the time of artistic expression—painting, art, poetry—and for the first time I’m writing about a bunch of Shadowhunters who are excited about art and poetry and what people are making. Matthew is fascinated by Oscar Wilde and other poets. Anna is a big enthusiast of this underground poetry salon where Downworlders gather and share their art and do shady things. It’s called The Hell Ruelle. Your first adult series is coming in two years and you sold the TV rights for Sword Catcher. Are you nervous or excited, what do you think is going to be different this time? I’m an executive producer so I have a lot more input, that’s good. I talk to the writer on the project a lot more than I ever did with writers on previous projects. It’s interesting because they bought it from the very detailed outline of the book. I didn’t think anyone would buy it. I sent it to my agent in California, saying “This is what I’m working on right now so you might as well see it, so that you have an idea of what I’m doing.” And he asked, “Do you mind if I show it to a few people?” And I said, “Yeah, you can show it to a few people if you want to, you’re my agent.” Then he came back and this producer, who I heard of as having produced a few things I really liked, loved it and wanted to buy it. There was no book, but he knew that, so I had to get on the phone with him and we talked. It’s been interesting because as I’ve been working on the book, I’ve been sending him pieces of it. And the writer – I can’t say his name – has been working on his outline and pilot for the network, he has been sending me what he’s been doing. So we’ve been exchanging. There’s always going to be differences, you always have to change things, but what I said to him early on was that I’ve always stuck by the rule that it’s okay for the characters to do things that they don’t do in the books, but it’s not okay for them to do things they would never do in the books. And that’s sort of our rule of thumb. That sounds so exciting, I’m so happy for you! The main character in Sword Catcher is Kellian, what’s one interesting fact about him? He’s a criminal and a spy. That’s really interesting because he’s the doppelgänger for the prince and then he’s a criminal. I don’t wanna tell you exactly what he offers, but let’s just say that he offers Kell something Kell really wants. “I will help you with this thing that you really want.” So Kell agrees and becomes this very dangerous thing— a Sword Catcher and also a spy inside the royal palace. It sounds so great! [Cassie laughed] I like that they start out as friends and then turn into enemies. This is really cool. Cassie: They always have this complicated back and forth: are they friends? Are they enemies? Are they sort of frenemies? This is probably going to be a quick question. You’re still a reader, you love to read when you’ve got time, what are books that you are looking forward to, which are published in 2019? It’s very exciting! I believe Jennifer Donnelly has a new book coming out [Stepsister] and I love her. I’m looking forward to the next book in the Three Dark Crown series [Five Dark Fates]. It’s dark and ruthless, it’s a fun series. I’m looking forward to all of those, there’s a ton of books coming out so it’s hard for me to keep track. I’m going to read King of Scars very soon. Oh, I’ve read it at a really early stage so now I’m excited to read the finished version. This is kind of related to The Wicked King [Cassie laughed] and Queen of Air and Darkness: who is the better Faerie king, Kieran or Cardan? I would say currently Kieran is the better king, but I believe Cardan will become a better king. It’s just that at the moment he isn’t doing a very good job. But that’s what I like about Cardan, he’s flawed. I think Cardan definitely improved at the end of The Wicked King. He did, he got better! I think he needed to care about being king. Initially he doesn’t due to a series of terrible things that happened to him. Yeah, and he also had to want to be king. Right, exactly. I think Kieran wouldn’t have been a good king in the first books or at the beginning of Queen of Air and Darkness either, but he’s become a person who wants to do something beneficial for his people. Yeah, talking about Queen of Air and Darkness. The ending was very shocking [Cassie chuckled]; the Shadowhunters are now exiled and there is a second Jace. Was this always the plan or did this happen like how the Cohort suddenly happened and became the main villain while you were writing? I tend to know the beginning and the end and I don’t always know exactly the path things are going to take to get there, but I knew the series was going to end with the Clave split in half and that Alec would become Consul, because that was my plan for him for a long time. I think I hinted at it a long time ago. The way that it played out was a little bit different, partially influenced by current events and things that are happening in the world. I became more interested in talking about a specific kind of governance and how that wasn’t going to work. Initially, there was more influence that was brought to bear by the faeries, the Unseelie King. It was actually a later decision to kill the Unseelie King when I did. I know he was going to die but I wasn’t sure when he was going to die. Instead of him having to die at the end of the book, I moved it to the middle of the book so that the Cohort could move into place and be the people who really drive the separation. Interesting! I like that you adapted to the current situation in the States, what was going on in American politics. It’s definitely American politics, but also what I was noticing around the world. What is happening in Brazilian politics, what’s happening in the Philippines. When I first started we were right in the middle of the French election. Everyone wasn’t sure if it was going to be Le Pen or if it was going to be Macron, and that was a big influence, because the older Le Pen was the head of the Front National and Marie Le Pen is his daughter. That influenced the creation of Zara. She’s a bit like Marie Le Pen, someone who was brought up with all of these beliefs and who’s become the same kind of monster that her father was. That’s a really interesting fact about Zara and Horace. But let’s move on to happier things: the Malec wedding at the end of Queen of Air and Darkness! How many times did you rewrite the scene until you were really satisfied with it? Oh, a lot of times! I always doubt my abilities with weddings because I’m not a real wedding person. I was terrible at planning my own wedding and I did have a list of the things I didn’t want: I don’t want dancing, I don’t want music or throwing the bouquet. I don’t want smushing cake in anyone’s face. I loved my wedding, it was very low-key and for me to try to plan a fictional wedding when I’m not a wedding person, I had to project myself into Magnus and Alec and what they would like. I knew it was going to be in California because that’s where The Dark Artifices is set, and I asked myself what the perfect California wedding would be. It has to be on the beach and for me it was important that the people that they loved were there. And then I worked forever on the vows because we’ve never really seen a full Shadowhunter wedding before in detail. I knew that we’d need vows, and Magnus and Alec wouldn’t write their own because that’s not a Shadowhunter thing. So these would have to be the right kind of vows drawn from a sacred text. I went with the Bible and the Song of Solomon and I kept writing down different potential vows and discarding them. I love that bit in the Song of Solomon about going out to find the one who my soul loves. It was a beautiful wedding and I cried a few tears. [Cassie looked very pleased]: Good. Happy tears, wedding tears. Are there any plans for Shadowhunter companion books like a glossary or a revised Codex? We’d like to do an updated Codex, definitely. We’re just trying to decide when. We could do one before The Wicked Powers but then we’d probably have to update it again. But then if we wait until after The Wicked Powers a lot of time has gone by, so I think it has to be discussed with Simon & Schuster in terms of when it fits into my publishing schedule because I’ve got so many books coming out. Okay. But there’s definitely a 10th anniversary edition of Clockwork Angel, which I’m so excited for! Can you say anything in particular about it, about the bonus content? I don’t know anything! Hopefully I’ll know more because it would be [published] next year so we start working on it this year. All I know is back when we did City of Bones, we’d do a Clockwork Angel one too. I don’t know if we want the exact same thing or similar stuff so that the books can go together. I love the gold-foiled cover of the special edition, it would be lovely to do a steampunk version with gears and a clockwork angel! That would be really fun. And I love the character portraits, so I’m sure we’ll do those again. We also did a lot of little advertisements and in-world ephemera throughout the book, so I’m thinking of some similar things. An invitation to de Quincey’s party would be fun, maybe a letter from Will to his family, that kind of stuff. Written extra content. Very exciting! Because I’m mainly looking forward to finding out the characters’ birthdays. It’s going to be very cool to celebrate the birthdays as well as the ones from The Mortal Instruments. Cassie: We’ll have so many birthdays to celebrate! Going back to The Dark Artifices, you’ve made sure to include a lot of diversity. You’ve had Ty as an atypical character, Diana as a transgender character and now you’ve added a poly relationship. Did you have to convince your editor or publisher to include this ship because it’s a YA novel? A bit. At one point my editor asked, “This is going where I think it’s going?” I said yes, and she told me to not go too crazy. She actually was pretty good about it, she took it seriously and didn’t complain at all, so she was very well behaved. [Cassie said this in a very tongue in cheek manner] I think it helped because it was signaled beforehand that the relationship was going to happen. Also, there was a strong implication that this is normal in Faerie whereas there’s still a sort of resistance to that kind of relationship here. Kieran comes from a culture where people don’t bat an eye, and he doesn’t understand why it’s a big deal. But my editor got into it. It’s really cool to have a poly relationship in The Dark Artifices. I think they’re really sweet. They are very in love and take good care of each other. It’s great that they found a solution to be together in the cottage. I know, I love the cute little cottage! The final question is once again related to writing. Were there significant differences between your co-authors and their styles when you wrote Ghosts of the Shadow Market, Tales from the Shadowhunter Academy and The Bane Chronicles? I mean, Sarah obviously loves to write really long stories. Yeah, we tried to sit on her, but she can’t be contained. [laughed] They’re all very different to write with. It’s super interesting, they’re all wonderfully talented ladies. Sarah writes very long [stories], but she’s also fascinated with certain characters so if you read a Sarah story, you’re probably going to see Lily or Raphael, or you might get information about Sebastian. In The Last Hours she loooves Thomas and she loves Alastair. So with Sarah you can predict who’s going to turn up. Maureen is great with historical details, so she wrote the Marie Antoinette story because none of the rest of us wanted to tackle Revolutionary France. She had all the details, and all the great Blitz details for A Deeper Love. Kelly writes dark fantasy/horror so she sometimes has to be pulled back from things that are too scary or too creepy. Yeah, gross, right? She loves that stuff! She also did the story with ghost Livvy so I had to tell her if things were too horror-like. Ghost Livvy is spooky, but the story isn’t a horror story! But she is a beautiful, beautiful writer and her prose is gorgeous. And Robin loves evil characters so if I give Robin a story, I have to think of who in the story is a terrible person. She obviously got the Valentine and Céline story because Valentine is a terrible person; Stephen Herondale has a really flawed personality, Céline is flawed, Robert is flawed. What Robin likes is a story of flawed people who make big mistakes. We gave her The Evil We Love in Tales from the Shadowhunter Academy because she wanted to write about the Circle, and I credit her with the entire Waywood ship. It existed a little, but she blew it up! She loves Robert and she loves Michael so she wrote the story of their pining for each other. I told her that no one would get over this, because it was a sad doomed love. So Robin and Cassandra Jean are the number one shippers. Okay, that’s the perfect way to end the interview. Thank you so much again, Cassie! While in London, I also managed to get some Shadowhunter Swag so one lucky reader can win these goodies in our international giveaway. I can’t wait to read about the adventures of Magnus, Alec, Helen and Aline. I am so relieved that Cassie will be an exec producer on the TV show — fingers crossed for that one!!! Also the warlock-frog-duck character is hysterical. Glad they found a way to keep him in. I cant wait to read about the adventures Magnus and Alec have on their vacation. As well as the start of Helen and Aline’s relationship. Wish to have the letter from special edition of RSoM! i’m so excited for red scrolls of magic because tmi focused too much on clace. Bane chronicles covered some of malec like their first date, but i still feel like we’re missing a lot of essential parts of how malec developed and i just love them so much. It’s just great that theyre finally getting a series that will focus wholly on them. I am so excited!! I love Cassie so much! I cannot wait for this! I’m intriguided by this half frog half duck character! IM SO READY FOR APRIL TO COME! IM A SUCKER FOR ALL CASSIE’S BOOKS. Really can’t wait for TRSOM because Malec AND Helene backstory? Hell Yes!! I have been obsessed with Magnus since I first read TMI back in 2013 and I love both him and Alec with my whole heart. I am thrilled that thay will have a whole trilogy all about them and I honestly can’t wait to learn more about Magnus and his past! I can’t wait to find out more about Malec adventures. I have a good feeling about this series.